Sunday, December 21, 1913: Went to Sunday School this morning. Spent the day in a lonesome way, any how this afternoon seemed that way. Sounds like a boring Sunday. 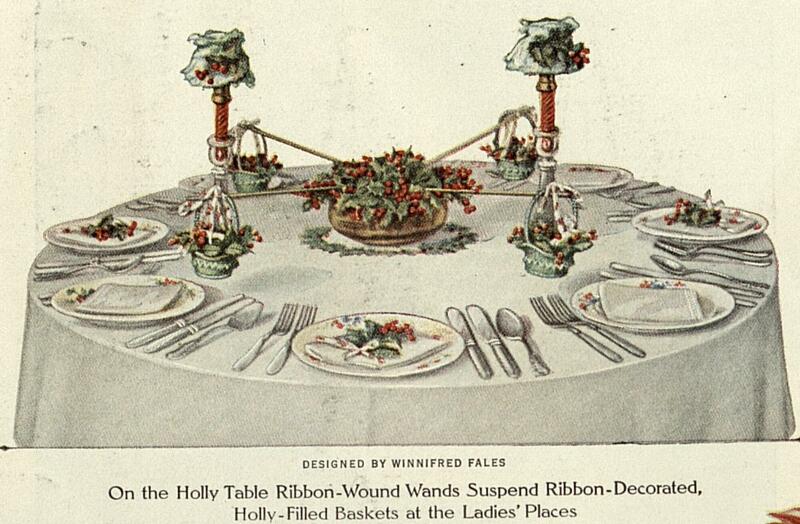 Did Grandma consider making of the holly centerpieces featured in the December, 1913 issue of Ladies Home Journal? Posted on December 21, 2013 December 20, 2013 by SherylPosted in OtherTagged centerpieces, family history, genealogy. I wonder if she and her sister were talking now. Maybe some leftover angst? Is it lonesome because she and her sister are not talking to each other, I wonder? Love the little pair of scissors in the first illustration. It makes sense to me that they might not be talking to each other. Holy cow–those centerpieces are amazing–the detail! Poor Helena . . . I hope she makes up with Ruth soon. 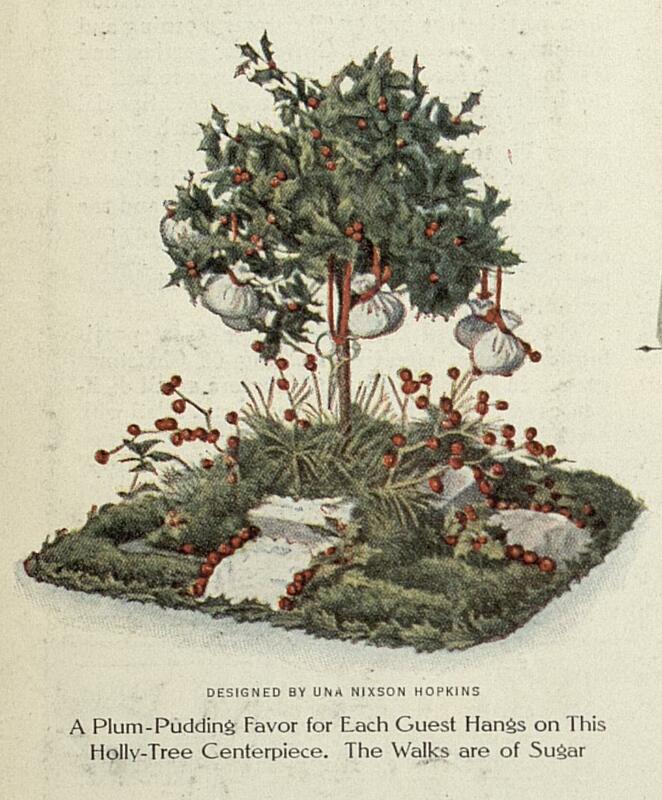 It’s amazing how much effort people apparently put into centerpieces back then. It makes sense to me that she might have found these winter months difficult. People won’t have known about Seasonal Affective Disorder back then, but it seems like the few hours of daylight in December would have affected their moods and lives as much or more back then when compared to now. I love the nature-inspired centerpieces! Awesome. And the sugar-cube walks are so cute! Quite interesting, that Grandmother feels lonesome this time of year. I don’t think they had all the fuss nor as many gatherings as we have these days. A little bit of “lonesome” could be a welcome thing right now. 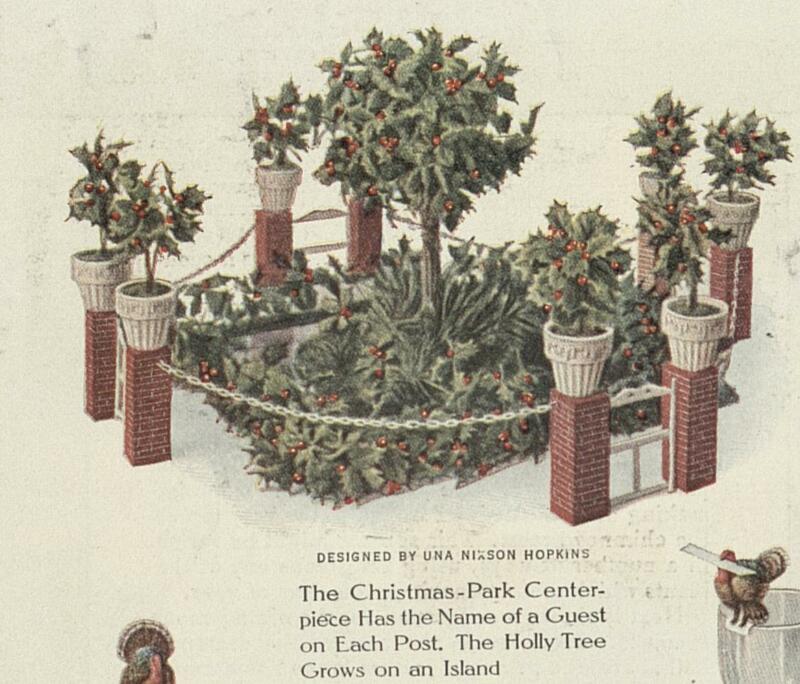 I like how they used materials that were readily available to make decorations back then. Love the holly. We use it a lot in the UK for natural decoration at Christmas time. Usually as garlands or wreaths. Nice to have it as a table centrepiece too. When I was a child we had a very large holly bush in our yard. The pictures bring back warm, fuzzy memories of how at Christmas we used to always cut holly and put the branches in a couple large vases. Wow. Fancy smancy center pieces! Maybe Helena felt left out from her circle of friends on this day? Maybe. . My sense is that since her high school graduation the previous spring that she’s often felt left out from her circle of friends. Ahh youth – I had sure had periods of time where I felt left out – I can relate! Sounds like Helena is trying to “find herself” and doing a little too much thinking and worrying. I hope she can relax and enjoy Christmas. Love the idea of holly in a center piece. I guess teens, both then and now, try to “find” themselves. Beautiful centerpieces (too bad holly doesn’t last too long indoors). I think all of your readers worry about Grandma when she seems “down”…. It’s amazing how the diary enables us to travel through time so that we can worry when Grandma seems down. Until I read your comment I hadn’t realized that holly can be toxic to cats. I’m always amazed how many things I learn from comments like yours. I’m glad you like them. I have fun finding the old pictures, ads, and articles. And, Happy Holidays to you and your daughter.